I have had a first generation iPad for nearly 18 months now and it has become my favourite computing device. Most of my web browsing and email consumption1 happens on the iPad instead of the computer. At conferences I see more-and-more physicists abandoning their laptops in favour of the iPad; it is so much lighter and portable than a laptop. 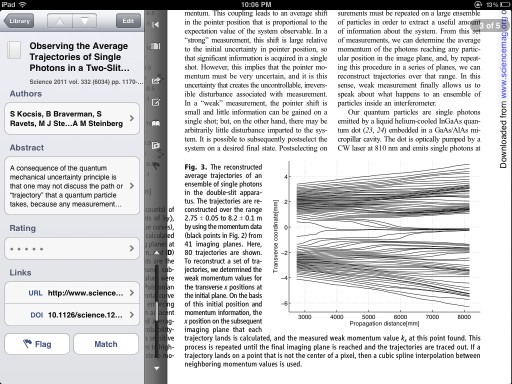 The iPad is a fantastic for reading PDF copies of academic papers (and scribbling notes on them too). I also use the iPad to take notes and work out equations. I no longer have to scan my notes and email them to myself, now they are all present in one spot. After a year-and-a-half here are the apps that have stuck2. The iPad is an excellent device for reading (as long as you are not in direct sun light). It has been a long time since I have carried a book or stack of papers around with me. This is due in large part to the following three apps. Papers is an app designed to house all of your academic papers. It includes an above average PDF reader and displays important meta data like the abstract, authors, and journal. Papers plays nice with other iPad apps too making it easy to fire over a PDF to any other app that supports PDFs on the iPad. Where Papers shines is when it is paired with Papers for Mac. For years I downloaded PDFs into a hodge-podge collection of folders on my computer. It became so hard to find a PDF in the labyrinthine maze of folders that it was quicker to just download the paper again. Along came Papers and I have never looked back. Papers strives to be the iTunes3 of your academic collection. Every paper I download immediately gets loaded into Papers. Searching and sorting papers is easy, and the built in PDF reader is optimized for journal pages. You can also search for and download new papers from within the app, but I prefer to use my web browser and the bookmarklet to automatically send a paper to Papers. Papers for Mac also has bibliographic support (for things like Latex), but I find it to be more miss than hit. For that I maintain a separate Bibdesk database. Papers for Mac can sync over WiFi with Papers for iPad, allowing me to take all of my papers with me. I rarely add a new paper to the iPad app. I find it too finicky and time consuming. But having constant access to every paper in my database is worth the price of admission. If you use the desktop version of Papers then the iPad companion app is a no brainer. If you don't own a Mac or use Papers then I would give it a pass. Good Reader is myy favourite PDF reading application. While Papers is great for academic publications, Good Reader is perfect for everything else. It is inexpensive, well maintained, and has excellent Dropbox and iCloud (amongst others) support. If anything, the program suffers from having too many options. This should be one of the first apps you install on a new iPad. Often when I am browsing the web I come across an article I want to read, but not right at that moment. Instapaper offers a clever solution to the problem. By installing a bookmarklet in your bookmarks bar you can send any article to Instapaper to read later. Instapaper strips out all of the ads and other crud typically found on other sites, leaving only beautifully formatted text. The reading experience beats the pants off of most other websites. Before Safari introduced its Reader function, I would send many of the articles I read to Instapaper just because the reading experience was so much better. A great deal of care has gone into this app and it shows. Before a trip, I often load up Instapaper with articles to read. 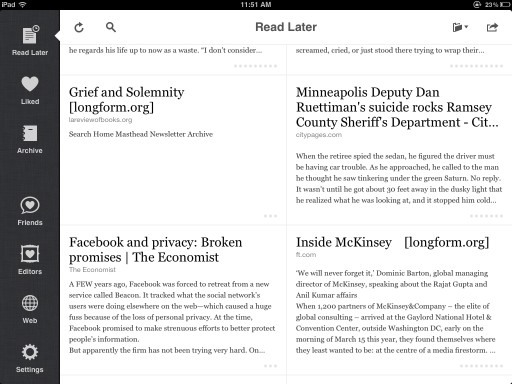 Longform.org is a great place to find interesting stories, and it integrates perfectly with Instapaper. Marco Arment, the developer behind Instapaper, also maintains an excellent blog I recommend checking out. For reading eBooks on the iPad I recommend Amazon's Kindle app. The app synchronizes with all of your Amazon.com book purchases. Some typographic improvements could be made to the app, but overall it is a straight forward no-fills approach to reading. For the most part the app just gets out of your way so you can focus on reading. I am currently using the Kindle app to read Michael Nielsen's new book Reinventing Discovery: The New Era of Networked Science, and it has been an enjoyable experience. 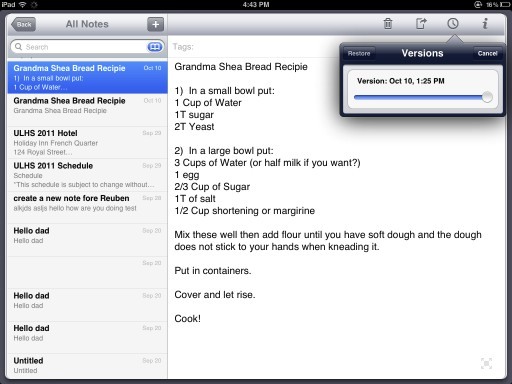 This is in stark contrast to Apple's bundled piece of e-reader crap, iBooks. I recently read Walter Isaaccson's tome Steve Jobs using iBooks. iBooks takes the metaphor of a real book too far. The page turning animations are cute for approximately three minutes. After that they become a distraction, breaking the immersion into the story. It is needless, distracting, and against Apple's typical "less is more" mantra. Even more unforgivable are the times when the app throws a seizure and randomly reflows a page causing you to lose your place. Unless Apple cleans this app up, I never intend on buying another book through their iBook store. 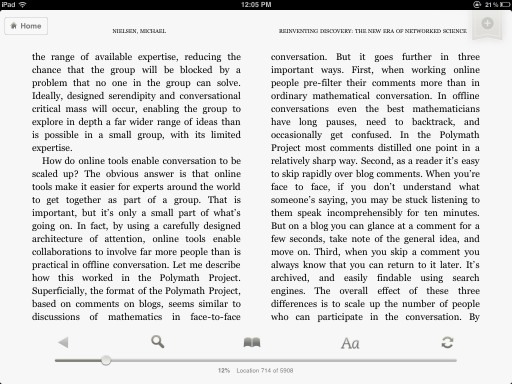 If you have your own eBooks (not through Amazon), then I recommend the app Stanza. It is a similar reading experience to the Amazon app (I actually prefer it), but it can be a bit clunky to synch new books to it. These are apps designed primarily for text input through either the on-screen keyboard or an external bluetooth keyboard. My two requirements for any writing app are Drop Box synching and automatically saving the files in plain text format (.txt). I am a heavy user of Notational Velocity,a simple note taking app, on my Mac. Before Notational Velocity I used to have dozens of different text files open, each acting as a reminder or temporary scratch pad. Notational Velocity excels at keeping notes, scribbles, thoughts, and drafts centralized and being able to quickly search for your text. Even with thousands of notes, the program returns search results nearly instantly. Notational Velocity makes the entire workflow of note taking frictionless. Just start typing to begin a new note, and saving is done automatically, so you never have to worry about losing your work. I use Notational Velocity every day for everything from short reminders to longer form pieces like blog posts or letters. Because everything is stored as plain text it is trivial to transport and share your documents. I have Notational Velocity set to store the text files in its database in a folder in my Drop Box account. I can then automatically synch these files with a writing program on my iPad. For an app to earn a place on my iPad it must be able to integrate with Notational Velocity. Of the dozens of apps I have tried, two have stood out. 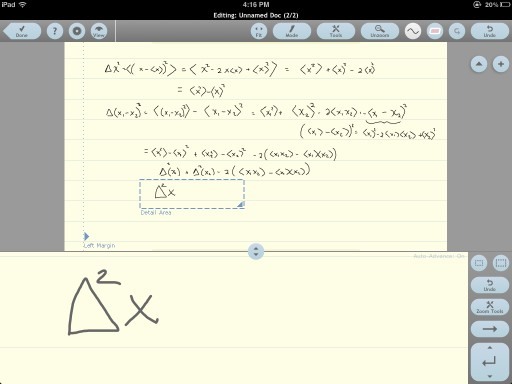 Simple Note is the closest implementation to Notational Velocity I have found for the iPad. It is a bare bones text editor that makes it painless to create new notes and automatically saves your work. The built in text search is fast, making it easy to find any note you have create. Simple Note uses a built in online service to integrate with Notational Velocity. Simple Note has a neat trick up its sleeve: versioning. You can easily revert back to a previous version of any document with an easy to use control button. This is handy as the program automatically saves everything you do. If you make a bone-headed mistake and overwrite important information it is simple to undo the changes. The combination of Simple Note and Notational Velocity works well to satisfy my text input needs. My only complaint is that the text from the notes could use some typographic help. The text is small and hard to read; this program is not suited for keeping presentation notes on. I began to look around to see if there is an app with better typography. My father was interested in using his iPad to read his sermons. Simple Note's type setting does not cut it. I decided to give Write Room a try. Write Room beautifully formats text making it much easier to read. The app embraces a minimalist design that resonates with me. Write Room has the option of storing all of its notes in Drop Box folder. This allows me to automatically synch with Notational Velocity; I have set Notational Velocity to store and read its notes from the same directory. Now my copy of Notational Velocity and Write Room are always up to date. The only downside with Write Room is that its search function is clunkier than Simple Note. Searching for files brings up a dialog box that makes it feel like an extra step is required. I can live with this minor inconvenience though, and Write Room has become my default writing app. 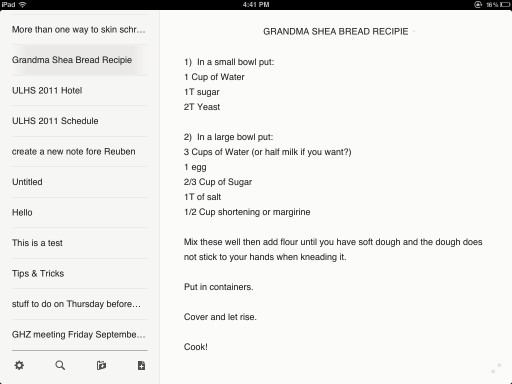 The iPad, with its touch screen, is a remarkably good hand writing and note-taking device. The iPad's screen has limitations; it is designed for input from fat fingers. Trying to write feels like finger painting. There are two ways to get around this limitation: using a stylus and clever apps. Steve Jobs famously said "If you see a stylus they you blew it". I agree for most things, but I find a stylus much more precise for writing and drawing. Any cheap stylus will do. I picked mine up for $12.99 CAD at a local book store. An entire breed of Apps has popped up that make it easy to take notes by hand. They do this by splitting the screen in to two sections. The upper portion of the screen is the document you are working in. The bottom screen contains a magnified few of a small region of document. This allows you to make nice, large and natural, strokes and have them automatically shrunk down to the size of normal hand writing. The best of these programs feature automatic stroke smoothing. The result is that my hand writing on the iPad is better than it is with a pen and paper. I even know of a couple of professors who write up all of their course notes on the iPad for this reason. These apps are especially useful for working out equations. It is then a simple matter to email a PDF of the results to a student or colleague. I have tried a number of different note-taking apps (Muji Notebook, Noterize/Paper Port, Penultimate, Bamboo Paper, and Underscore Notify) but these are the three that have stood out for me. Each app does something I like, but right now I still have not found the perfect app for me. Note Taker HD was one of the first apps to support the magnified zoom view for writing. It offers a number of different paper styles, above average stroke smoothing, and a plethora of options and settings (too many in my opinion). It does a good job and is currently rivalling Notability as my go to note taking app. It feels clunky though. Options do not always "stick". The design is ugly. I don't understand why developers feel they must reinvent their user interface instead of using standard components from the developer kit. Very few people can pull this off, and Note Taker HD is not one of them. Note Taker HD has also been updated to support text entry (via keyboard) as well. It does this by bringing up a side bar where you enter text. You type this text in the side bar and then it appears on the page off to the side. I wish you could just enter the text directly on the page. Fortunately I never use these apps for text entry, just handwriting. In fact, this is the only way I have ever seen anyone else at a conference use this app. A big plus is that this app has a very active and responsive developer. Updates are constantly available, and there is a large community of users that has developed. I find the shape function hokey and have turned it off. The audio recording option is nice, but I still have not used it for a serious purpose yet. It may come in handy one day though. The text insertion works well, but I do not need this feature. The handwriting can sometimes become jagged and my documents have occasionally experienced minor visual glitches. The app also feels sluggish on my first generation iPad. I am not a fan of the faux leather used in the app though. After using this app extensively, I have now left it for a combination of Note Taker HD and Notability. Notability has recently shot to the top of the iTunes store download charts. It is cheap and had good reviews so I took the plunge. Notability fixes many of the complaints I have with Note Taker HD and Notes Plus, but introduces some irritating limitations. The application takes a different approach to documents. Each page is designed to take in text input from a keyboard like a traditional writing app. There is an option to insert pictures or sketches. Choosing to insert a sketch brings up a second window with a number of drawing options. When the sketch is complete, it can be resized and placed anywhere in the document. Text that is being typed automatically flows around any inserted sketch or image. This is a nice option if you are interested in using the program this way. For me, I am primarily interested in how it performs for capturing handwritten notes. 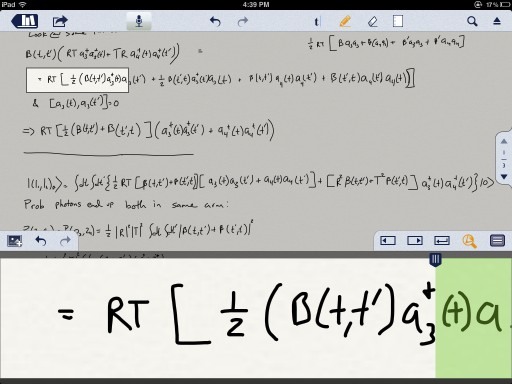 Notability has the best implementation of the zoomed handwriting mode of the three. It has excellent stroke smoothing, is never laggy, and the auto-advancing is well done. I just wish it was possible to change the size of the magnified area. Right now it is quite small meaning the text you write is shrunk to a tiny size on the page. You can fit more on the page, but there is no way to write significantly bigger. UPDATE It has been pointed out in the comments that the size of the target box can be adjusted by using pinch-to-zoom on it. I have tested it and it works! This somewhat mitigates the following complaint. A bigger problem is that the program does not allow you to pinch to zoom in on a portion of the page using the writing tool. Often I will want to include a sketch, plot, or diagram in my Notes. It is possible to draw directly on the document using the pen tool, but this leads to crude, giant, drawings like using a dry erase marker on piece of paper. The way Note Taker HD, Notes Plus, and just about every other drawing program out there gets around this is by allowing you to use the standard pinch-to-zoom gesture to magnify an area of the document and then begin your drawing. This allows you to make detailed sketches that, when you zoom back out, are appropriately scaled. Bafflingly, Notability does not include this feature. Instead, you must use their sketch mode that opens a separate window. Even there pinch-to-zoom is not implemented. The result is frustrating and limiting. If you frequently need to sketch diagrams, consider going with Notetaker HD instead. The other annoying thing about Notability is the lack of background choices. Specifically, there is no option for using a simple, white, background. The default background has a slight tint to it. There are a number of backgrounds available, but why this most basic one is not included is puzzling. Notability is the best looking app out of the three. While it looks good, I wish more care had gone into thinking about usability issues. Instead of employing the standard convention with folders and files, the developers have implemented their own take on a file structure. The result is that it is frustrating and time consuming to do things like move a file from one folder to another (it took me a week before I realized this was even possible). There is a standard way to do this in iOS, but instead the developers have gone out of their way to reinvent a crappier wheel. Despite these limitations, I am sticking with Notability for now. The zoomed handwriting is good enough that it is worth enduring the other hassles. 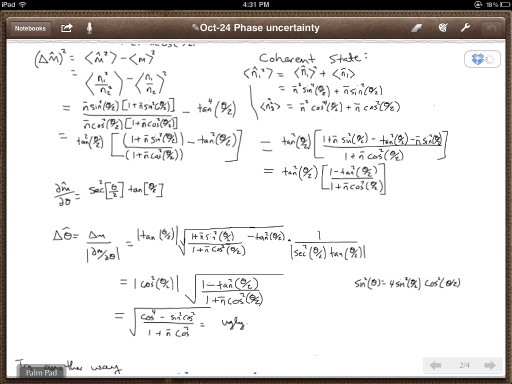 Another nice thing about Notability is that it is easy to mark up PDFs. If I need to sign something or proof read a document, Notability has become my go to app. I am still disappointed with the note-taking apps out there. They are all lacking in some way. What is annoying is that if I could somehow make a Frankenstein app that merged only the good bits of each program it would be close to perfect for my needs. For now, I think either Notability or Note Taker HD have the best chance of overcoming their respective limitations. If a better app comes along I would not hesitate to switch. Drop Box is the glue that ties together many of the applications on the iPad. It acts as a file system in the cloud that allows files to be seamlessly shared amongst Macs, PCs and mobile devices. Apple has recently released iCloud, their take on how cloud storage and synching should take place. It is very good at what it does (as long as you have bought into the entire Apple ecosystem), but for many uses Drop Box pants it. Drop Box has become such an integral part of my work flow that I have upgraded from their free account. There are other cloud services out there, but Drop Box has become as close to a standard as you can get. 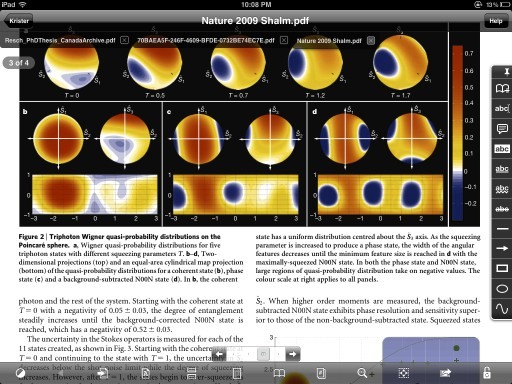 The iPad is becoming a versatile tool for scientific applications. It is by no means a laptop replacement, but there are certain things it can do far better than any laptop. Note taking and simple email and web browsing are some of those things. That is why I think iPads are becoming so common at conferences. It used to be that while giving a talk I would look out and see a sea of laptops open. More frequently these are replaced with less conspicuous iPads. In the coming years I expect laptops to become rare and endangered species at conferences as tablets take over.